Unlike the famous and influential Herder, the poet of Lebensglück, Op 88, is unknown. 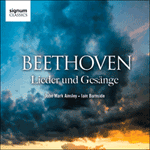 On 22 October 1803, Beethoven’s friend Ferdinand Ries wrote the publisher Nicholas Simrock in Bonn to say that Beethoven had sent him the words of his new song, Glück der Freundschaft, the title subsequently altered for its publication that same year. The old axiom that 'shared joy is doubled, shared-sorrow dispelled' is brought to melodious life at the beginning and then flowers into a celebration of love, its joy made evident in the triplet figures in the piano—greater motion to tell of love’s vitality—and the trills of delight at song’s end. This day of common brass. Of Truth and Nature feeds. And all around him smile.